provides access to the children of a folder content. It can be understand as a table containing a row for each child. The table columns may contain values of properties of the children. can be implemented to provide a complete JDBC conform result set interface for the implementation of this service. The implementation of this service is optional. holds properties of the result set. 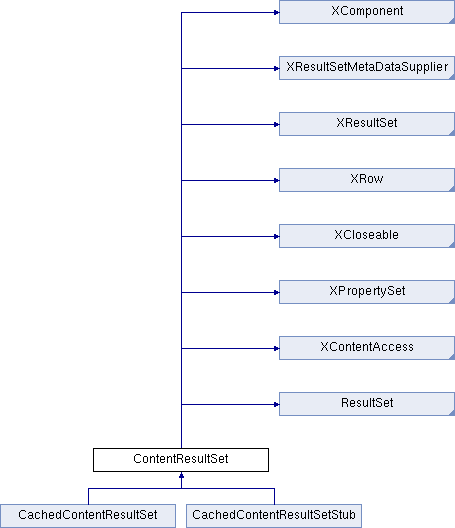 must be implemented to make it possible to resolve cyclic object references ( i.e. which may hold the property set ). makes it possible to abort running activities ( i.e. to cancel retrieving data from a server ). Note that every method of this interface implementation additionally may throw a ResultSetException ( which is derived from com::sun::star::sdbc::SQLException to be compatible to that interface ). The new exception transports another exception, which indicates the reason for the failure of the method call. enables traveling through the result set members ( the contents ). This interface mainly provides a cursor for the result set. provides access to the result set meta data. Meta data are for example the number of columns of the result set, information on the data types of columns, column names, and more. provides access to data of the content the cursor is pointing to. provides access to the content identifier and the content object itself. controls the travel mode of the result set cursor. CursorTravelMode::BLOCKING Each travel method of the result set will not return until the data for the new position were retrieved. CursorTravelMode::NONBLOCKING The implementation will throw a CursorWouldBlockException, if the data for the new position are not retrieved yet. // No more data at the moment. If this property is not supported, the implementation needs to provide a blocking cursor. The implementation initially needs to set the value of this property to CursorTravelMode::BLOCKING. indicates that all rows of the result set have been obtained. contains the number of rows obtained (so far) from the data source.